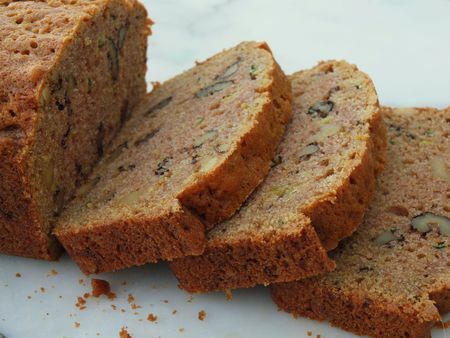 This is my other zucchini bread recipe (Chocolate Zucchini Cake is another great use of those plentiful squash!) It’s a classic, and sure to please a crowd. I’t’s one of the first recipes I added to my own recipe book growing up. The recipe makes enough to give away some, so it’s a perfect hostess gift. Preheat oven to 175C / 350F. Grease baking pans. Place nuts on baking sheet and toast in oven for 5 minutes. Chop into small pieces. In a large bowl, mix shortening and sugar well. Add eggs one at a time, then mix in zucchini, water and vanilla. Add dry ingredients in two batches, mixing gently each time. Lastly, stir in raisins and/or nuts if you’ve chosen to include them. Pour batter into pans till 1/2 to 2/3 full. Bake for approximately 1 hour, or until golden on top and knife inserted in centre comes out clean. Let loaves cool 5 mn in pans on wire rack. Then run spatula around edges of pan and demold on rack to complete cooling.